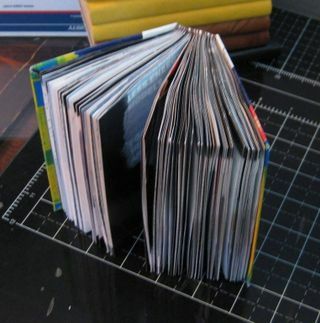 I've been working on this idea of some 100% recycled sketchbooks. 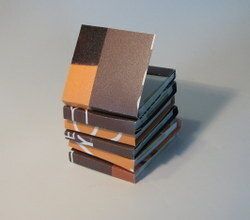 I've been fascinated for some time with the idea of gesso'd pages made of newspaper or magazines. 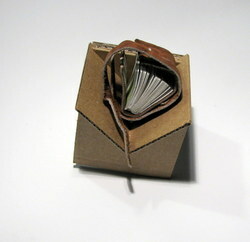 I first experimented with this idea back in 1999, I gesso'd a hundred or so pages of newspaper and drew on them. I have no idea where those pages went or what ever happened to them. All I know is that I love to draw on gesso, especially when it's on top of chunky paper. The rougher the paper the more i like it. 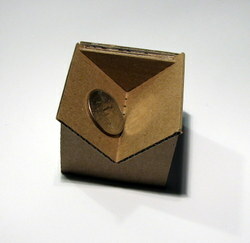 So why would I want to experiment with gesso on magazine apges? Color and pattern. It takes away the fear of the precious white page, the empty the making of the first mark. The first mark is there just whited out with gesso. I used a thin layer of gesso to cover up the words and images from a national geographic special magazine. I snagged 3 copies from the trash, chopped and stitched it up into a 3.5×5 inch book that is just a hair over 1 inch thick. 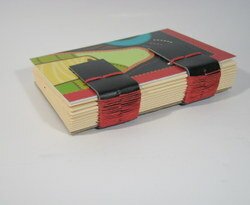 The binding is a standard button hole style binding. 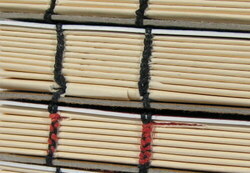 I fouled up the spine a tad, but the spine is made of a recyled tyvek envelope that I had recieved somethign in. The book is about 98% recycled. The book board inside is not recycled and the thread is of course new material, but the rest all recycled. I digress. 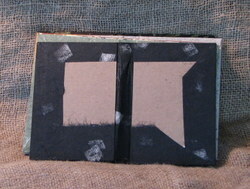 I went through the book with brush and gesso and put a thin layer of gesso over images and words. I lightened pages that were too dark to write on. My first intent was to draw in this book with a ultr fine point sharpie or pigma pen. The pages are so slick that thegesso adhere'd well but will still scratch off, which leads to more ideas but wasn't what I had planned on. My initial goal was to use this as a sketchbook and journal. Sketching is easier in this book than writing. Mainly due to that issue witht he gesso scratching off. I intended for this to be somethign of a prototype of sorts. I wanted to do a limited edition with pre-gessoed pages BUT it took so long to gesso up the 300 pages (all day) that I'd have to charge an exhorbitant amount to sell these and recoup any profits. Anyway, I'm in love with the size and chunkiness of the book and I've been using it a little bit here and there. I am going to make a few one of a kind versions of the book. BUt be aware you'll see some more sketches on here than you have in the past. This entry was posted in Uncategorized and tagged art, bookbinding, drawing, journaling, sketchbook on 20090710 by leslie. driving anywhere in this garbage is pretty bad. hold signatures in place while they are being punched. someone special some recycled journal for valentines day! 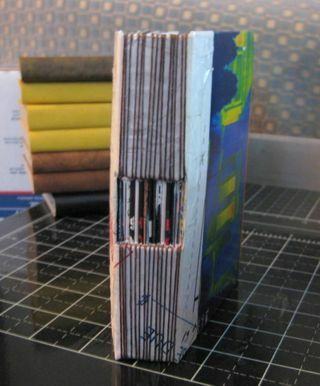 This entry was posted in Uncategorized and tagged art, book, bookbinding, craft, drawing, note, notebook, sketch, supply on 20090107 by leslie. 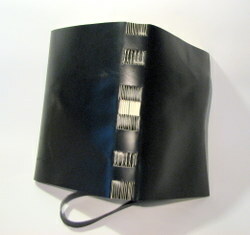 This is Keith Smith's first book on book binding and a great one. 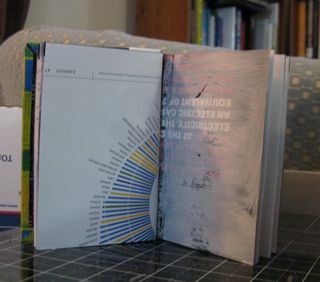 All the styles he lists in this book require no specialized tools or equipment and can be made by anyone with patience and determination to create books. While this book was not my first on binding it is one to which I return to for clarification when I have a question. These styles of binding are those that once you learn them you'll be able to make them again and again without referring to the book or diagram. The entire first section is devoted to paper and tools. 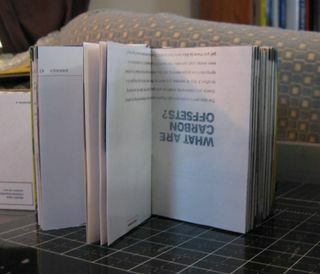 It's an excellent introduction to basic bookbinding tools. In this section Smith gives the most detailed and best description and instructions on pasting I've ever read. The instruction starts with simple pamphlet sewn books and moves its way up to more complex styles. This is an introductory book but it is an excellent reference book for those of us who have been binding for years. It's not the easiest starter book out there, but if like me, you tend toward liking clear excellent diagrams and detailed descriptions this is a good book to start with. I would also recommend it if you are simply looking for a good reference on binding or are looking for a great introduction to pasting your own book cloth. 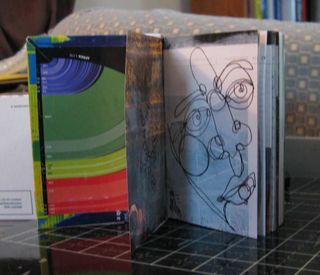 This entry was posted in Uncategorized and tagged art, book, bookbinding, craft, creating, journaling, keith smith, make, review on 20080609 by leslie. Take a look at this book. It measures 9×12 inches and has 192 pages. The paper is 60lb drawing paper and will handle just about any media. 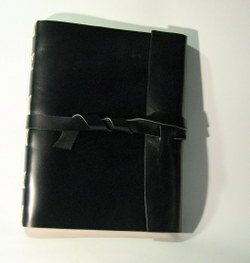 The cover is stiff smooth black cowhide. Features a flap and strap closure. 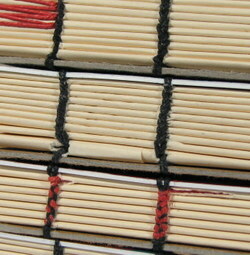 The binding is a longstitch with linking and a keyhole cut into the spine. I have a lot more pics on my flickr page. This one is sold (custom order) but I’m working on another in golden yellow deer hide. 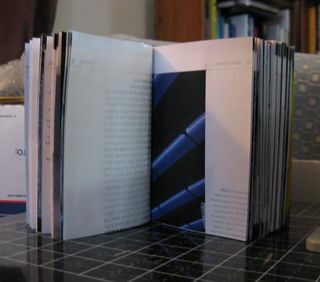 This entry was posted in Uncategorized and tagged art, bookbinding, craft, diary, drawing, journal, notebook, sketchbook on 20071126 by leslie. 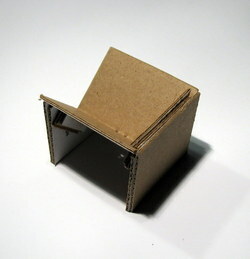 This entry was posted in Uncategorized and tagged art, bookbinding, craft, handmade, sewingcradle on 20071123 by leslie. centuries and it works and it’s not too hard. cheap and easy to find. All you need is pastry flour or wheat starch and water. will neutralize any acid content. best but student grade sumi painting paper is more than perfect. you want a thin EVEN layer. 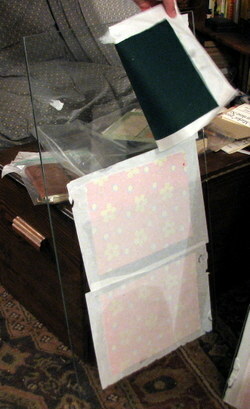 to drop your fabric to the glue covered paper wrong side down into the glue. the glass, if it doesn’t it cleans easily with soap and water. archival or acid free. (Let it be known here that I’m not an acid free freak. are going to outlive you and probably your children. 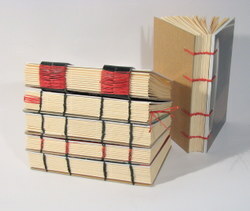 This entry was posted in Uncategorized and tagged art, book, bookbinding, bookcloth, craft, handmade, making on 20071121 by leslie. 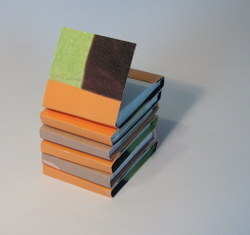 I finished taking pictures of the matchbook notebooks this morning and I posted 3 sets to etsy. I just got done with it a few minutes ago. I decided last minute to put a set up on eBay and I’ll have that up ASAP. It’s always fun to put stuff up for auction and watch the bidding. 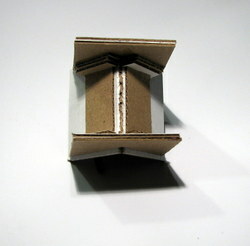 This entry was posted in Uncategorized and tagged bookbinding, craft, handmade, matchbook, notebook, sale on 20071118 by leslie. First off I think the purpose of being in a group online is to gain ideas, learn new techniques and for inspiration. This person became INSPIRED by the previous poster’s materials and was using that as a springboard for their inspiration; in my mind exactly why one might join a group. Secondly, in terms of originality, we’re talking about a centuries old art/craft that is gaining a revival but that means that in some terms it’s all been done before. This wasn’t the first time I’ve seen a cassette tape book and I’m sure it won’t be the last. It’s been done before but that doesn’t mean that it can’t be done again in a new and original way. In this case- the 2 halves of the cassette were taken apart, attached to board and decorations placed on the board, original. If I got my undies in a knot every time I saw a limp leather long stitch book, my feet wouldn’t have any circulation; ya know what I’m saying? The simple fact is that when working with a centuries old art/craft you can’t get upset when you see something similar on the net. I’ve been putting my work online for over 6 years now and I’ve seen blatant rip offs of my patterns and designs, and I get pissed momentarily and realize that’s the permeability of the web, one of it’s great features. If I don’t want someone ripping off my design I shouldn’t put them up on the ‘net. When I gain inspiration from someone I try and give them credit and I think that’s simply courtesy. My main point is here is that bookbinding is a centuries old art/craft and essentially with the exception of a small handful of us, it’s all been done before. Even if you’re attaching something unusual to the covers of a book it’s been done. So can we all untwist our undies and get back to making and enjoying books? 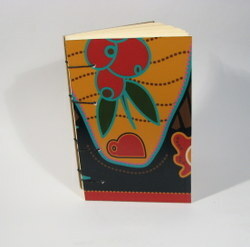 This entry was posted in Uncategorized and tagged art, bookbinding, craft, create, design, handmade on 20071112 by leslie. This picture above is of the covers finished but not attached to a book block. This shows one of the covers "inside" before additional support is added to the spine. My favorite additional support is tyvek. 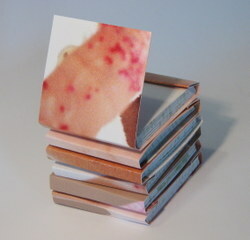 But you could add a nice washi paper of any paper really and glue it in along the spine. Then glue in teh book block. This entry was posted in Uncategorized and tagged art, bookbinding, cover, craft, handmade, hardcover, washi on 20071111 by leslie.